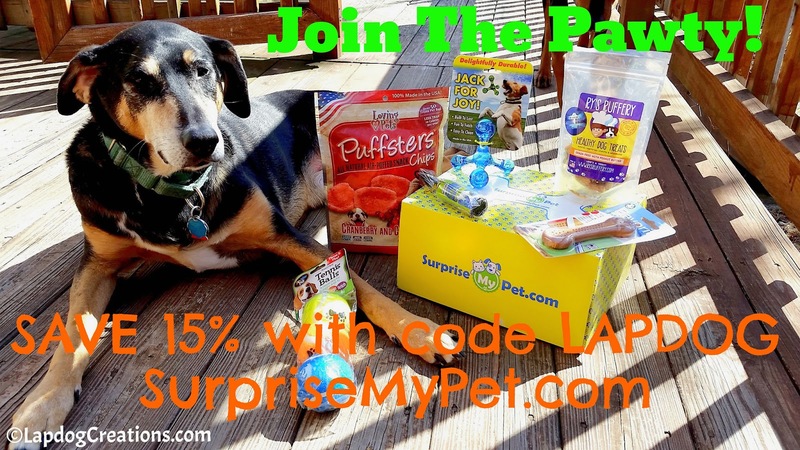 Plus, when you buy a Surprise My Pet box, not only are you making your own dog happy, you are helping shelter pets in need. 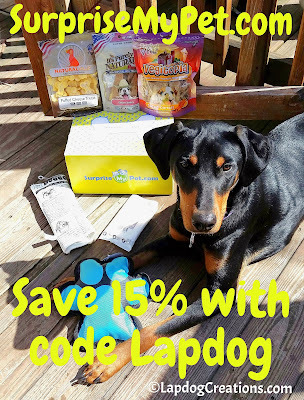 For every box shipped, a portion of the proceeds goes to charities such as Animal Rescue Foundation, New Beginnings Animal Shelter and Friends of Animals. 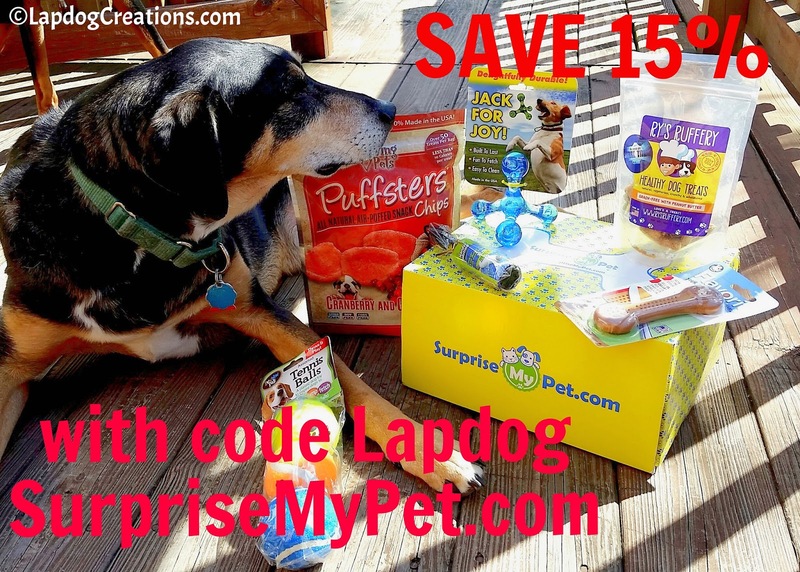 But that's not the only thing that sets Surprise My Pet box apart from the competition. Yes, that's right... a little birdie told us that Surprise My Pet will be adding cat box subscriptions very soon! 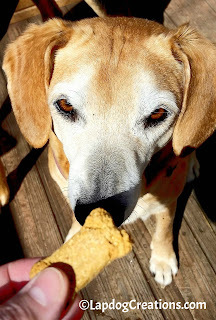 The Lapdogs loved these peanut butter treats, and I was excited to see them as we are big fans of Shark Tank and watched Ryan score a deal with Barbara during season 4! All-natural, vegetarian, grain-free and Made in the USA. 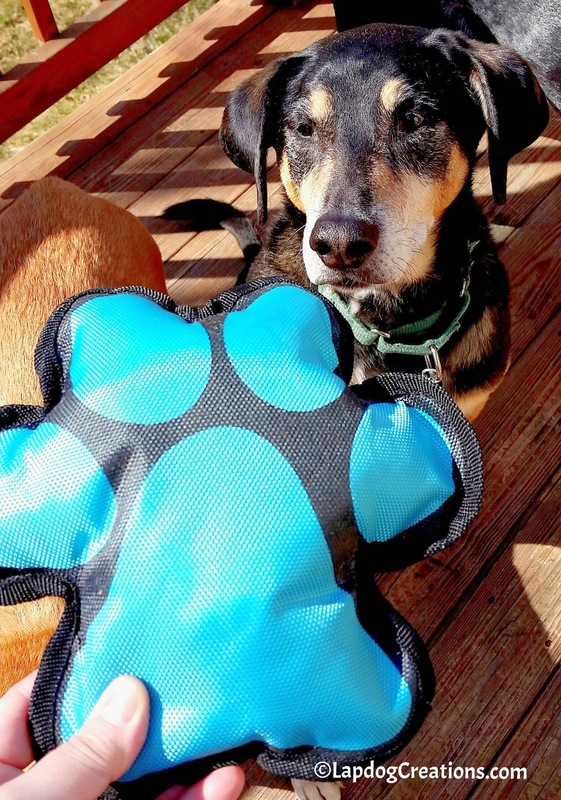 A funky little jack-shaped tumble toy made of durable non-toxic, chip-proof plastic. If you know Penny, you know the girl loves her tennis balls. She was thrilled with this brightly colored 3-pack! 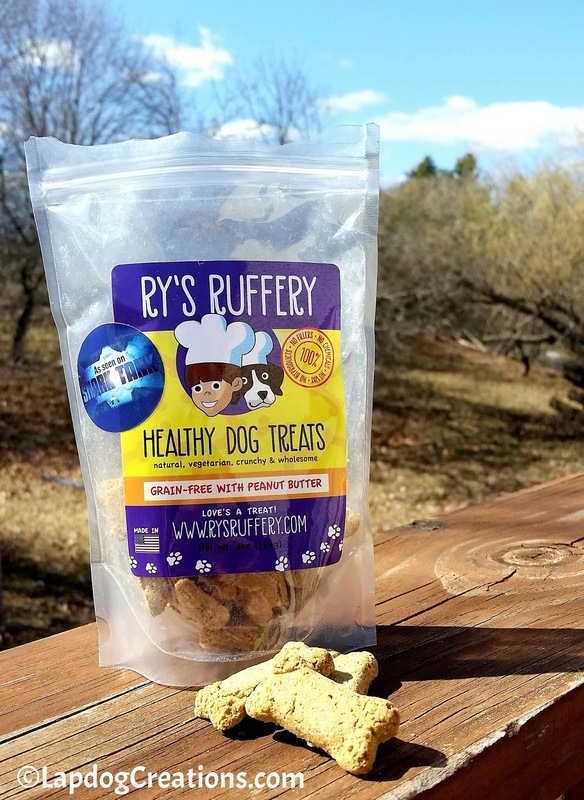 Made in the USA, infused with peanut butter and designed to use with your dog's favorite spreadable treat such as cream cheese, yogurt, pumpkin, apple sauce, etc. Dishwasher safe. 100% sourced and Made in the USA, these 10 calorie air-puffed treats are all-natural with no additives or by-products. As any true pet parent knows, you can never have too many lint rollers. This one is a great size to stash in my purse or car. Made with just one single ingredient - carrots. Teutul thought they were delish! The Doggone Times is one Penny's new favorite toys. She runs around the house with it daily, making crazy crinkling noises that make her humans think she's up to no good! The most adorable, big, fat, padded paw print, completely with a squeaker inside. It's held up to hours of play, and Sophie's drool! Wipes are often invaluable for pet parents, however these ones happen to be made in China so we'll be passing them along. You're probably thinking, "that's a lot of Loving Pets products." I agree, and certainly hope to see more brand variety in future boxes. In the meantime, I do appreciate that they are all different types of treats and most of all, they are made in the USA. I hope to see more brands like Ry's Ruffery in the future. it back and wait for the pawty to land on your doorstep! Cat parents, stay tuned for those cat box subscriptions to start soon! Looks like a great gift bag, my dog would love that. Thanks for the post! Wow! That is a lot of goodies in one monthly box! I learned this weekend that Bebop promptly shreds every toy he gets his teeth on. And Natasha is indifferent to toys. But Tank loves toys,m especially the ones with squeakers, and Lily wants what Tank has. Maybe I should buy one of these for Jeff instead of a birthday present? 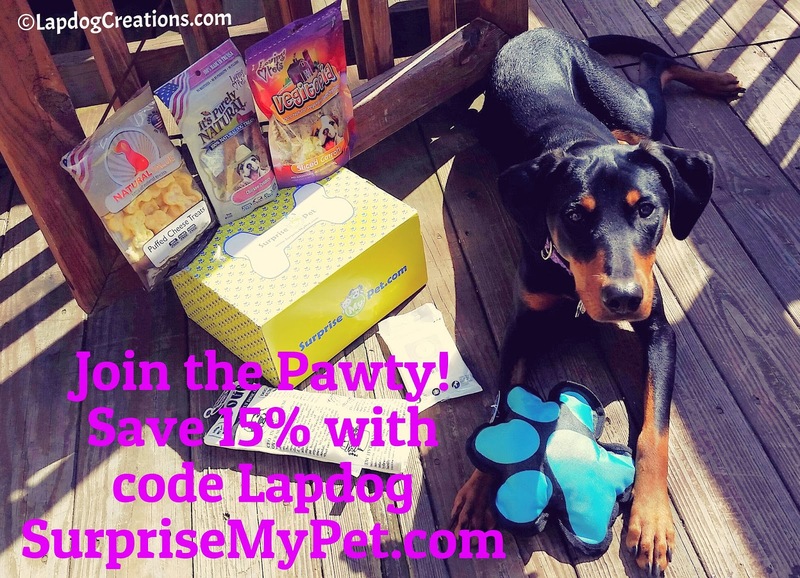 How awesome for any dog to receive a monthly box like this! And the cats won't have to be jealous now that there will be one for them too! We were lucky enough to receive the February box and our boys loved it! I was very impressed with the quality and variety of the items inside. Very cool that they are going to be branching into cat boxes! Cool assortment of things. I think Mr. N would like the cheese puffs! Looks like a lot of terrific products in those boxes. My dogs always love getting a package in the mail.